Elliot Holtham grew up in Victoria British Columbia. He obtained a BASc in engineering physics (electrical option) at UBC. During the co-op program in his undergraduate degree, he had the opportunity to work on applied electromagnetics at an applied biophysics laboratory as well as a quantum computing company. Elliot is now a geophysics PhD student at the Geophysical Inversion Facility at UBC. 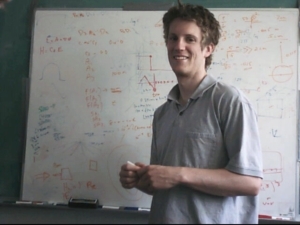 His research focuses on developing 3D electromagnetic inversion algorithms for natural sources. In his spare time, Elliot enjoys fishing, skiing, and climbing. Along with racing in a few triathlons, Elliot is an avid cross country ski racer. To maintain our strong resource tradition in British Columbia it is necessary to find new deposits. With technological advances we are now in a position to find deeper and more difficult to find targets. Since drilling is often prohibitively expensive for such targets, it is crucial that geophysical techniques are developed to accurately image the earth. Electromagnetic surveys can be used to recover a 3D conductivity model which can then be linked to rock properties of economic interest. Significant drawbacks for active source EM techniques include the limited penetration depth due to the geometric decay of the source fields. In addition, ground-based surveys can be time consuming and costly because equipment must be constantly moved. To overcome these drawbacks, and to explore to greater depths and under conductive cover, it is possible to use plane wave electromagnetic source fields from lightning and solar events. The recently-developed airborne ZTEM survey uses these natural source fields and is an improvement over the AFMAG system flown two decades ago. In a ZTEM survey an aircraft measures the vertical component of the magnetic field over an area. The data are then transfer functions that relate the vertical component of the magnetic field at the location of the aircraft to the horizontal fields recorded at a base station. Frequencies between 30-3000 Hz are available and thus conductivity structures to a few kilometers can be imaged. My doctoral research will be focused on improving the inversion algorithm to invert ZTEM data and also magnetotelluric (MT) data, which also use natural sources.